Just because summer is over doesn’t mean you can’t enjoy Glacier National Park or the surrounding Flathead National Forest. But where do you stay when most of the lodging facilities in Glacier Park and the surrounding areas close down in the middle of September? Smoky Bear Ranch is open all year around. Located just 9 miles from West Glacier along the western border of Glacier National Park in the midst of forest, a perfect, quiet location to set up your base camp and enjoy activities in and around Glacier Park every season of the year. The Grizzly Cabin is a great place for your fall or winter getaway. If you’re looking for a quiet place to have a family Christmas gathering, you couldn’t ask for a better place, we’ll even decorate it for you complete with a Christmas Tree. Ample heat from electric baseboard heaters throughout the cabin, and a wood stove with glass door that will create a wonderful ambiance. If you’re looking for a smaller, more intimate accommodation, consider the Little Griz Cabin, also available year around. It’s a great accommodation for a small family or 4 adults. Equipped with a propane heater that will keep you toasty warm in the coldest weather. This cabin has a great off-season rate of $149/night for up to 4 people. But if you want to be pampered, we have 3 bed and breakfast rooms available all year in the Lodge with great off-season rates starting at $99/night for 2 which includes a full, hearty, Montana style breakfast. Should you decide to spend a Christmas with us at the Lodge, rest assured it’s all decked out for the season. Most of Glacier Park is open and accessible until about the 20th of October. That means you can access nearly all of the hiking trails in Glacier Park, Fall being one of the best times of the year to hike. There are considerably less people on the trails so you can thoroughly enjoy the serenity of Glacier Park. The weather is perfect with cool mornings and excellent hiking temperatures during the day (highs in the 60 and 70 degrees Fahrenheit range). You can even encounter temperatures into the 80s, and the fall colors are fabulous. In late September, you will get the yellows and golds of the Aspen, Birch, Cottonwoods, along with several of the underbrush. There is also the bright reds of the Mountain Oak, Cascade Mountain Ash, and numerous shrubs. If you visit later in October, the Larch and Tamarack are changing color. Larch and Tamarack are deciduous pine trees turn to brilliant gold – the contrast against the other pine trees rolling up and down the mountainsides is absolutely stunning. Fall colors just don’t get any better. Even though motor vehicle access is restricted into the high country of Glacier Park toward the end of October, you can still enjoy it. The Going-To-The-Sun Road is open to hikers and bicyclists until the snow flies. One of the best ways to enjoy the Going-To-The-Sun Road is by bicycle and what better time to enjoy a ride on the Road than when you don’t have to worry about vehicular traffic. And fishing? Fall is a great time to fish the local rivers. The river levels are at their fall lows which makes the fish more concentrated. 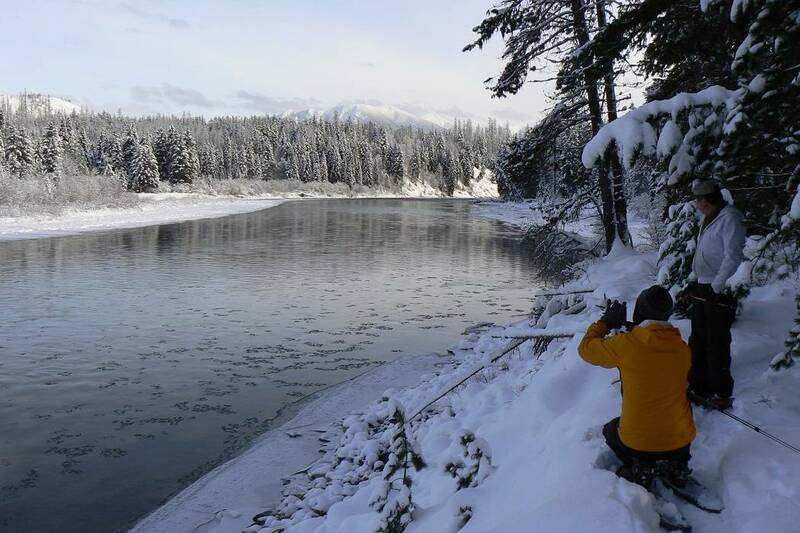 We have direct river access on the North Fork of the Flathead River – one of Montana’s premier rivers for fly fishing. Once the temperatures cool down in the fall, the wildlife viewing becomes better also. All the large game that have gone to the high country during the heat of the summer return to lower elevations to prepare for the next season. As winter arrives and the snow begins to fall, other activities become available. The Going-To-The-Sun Road is open to vehicle travel as far as Lake McDonald Lodge from the West Entrance, and just because the alpine section of the Road is closed to vehicle travel, doesn’t mean you can’t enjoy it. 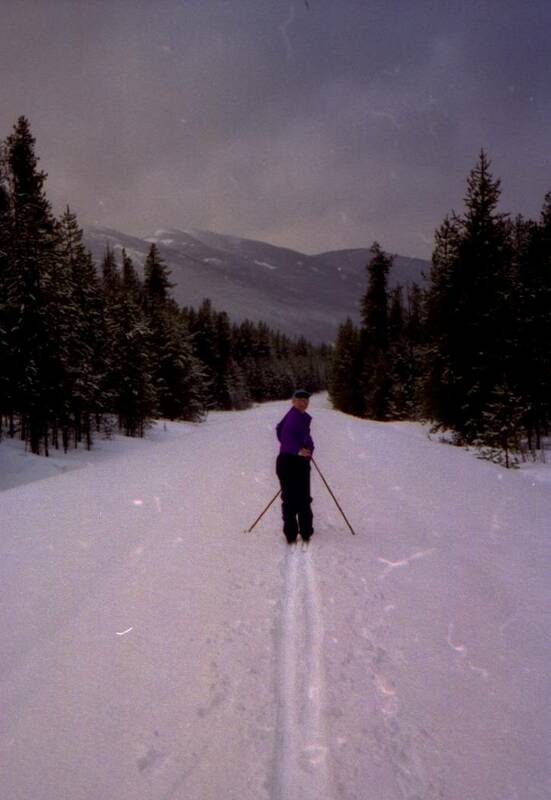 Cross country skiing is a great way to explore the sights along the Road. Although they don’t groom any trails for cross country skiing in Glacier Park, there are enough people looking to enjoy a winter outing that at least one cross country track can be found. Of course, if you want more of a workout, there’s always plenty of room along the Going-To-The-Sun Road to break your own trail. You can travel as far as you’re inclined along this Road and can even plan an overnight winter camping trip. It’s roughly 2½ miles one way to McDonald Creek Falls, or you can continue up the Road to Avalanche Creek, about 5 miles one way. You can even go the additional 2 ½ miles up to Avalanche Lake – a trek off the road on a trail through the woods. Avalanche Lake is absolutely beautiful in the winter. There are other places to cross country ski in Glacier besides the Going-To-The-Sun Road. One of our favorites is a trek on the road to Bowman Lake. This trail is traveled significantly less so there;s a good chance you’ll get to break your own trail. It’s about a 12 mile trek round trip to Bowman Lake with many curves and hills so you’ll get to practice all your cross country skills. You can also cross country ski along the Camas Creek Road. This is also traveled less and likely able to break your own trail. It’s curves and hills are more gradual than the Bowman Lake Rd therefore it’s not as challenging. These are just a few examples of places to cross country ski. Any of the unplowed forest service roads off the North Fork Road are also great places to cross country ski, only a few of these roads are plowed during the winter so there are lots of options. Snowshoeing is another great winter activity. There are many great places to snowshoe both in Glacier Park and in the Flathead National Forest. There are many that snowshoe on the Going-To-The-Sun Road but we like to explore the less traveled areas. There is the Three Bears Lake trail which starts at Marias Pass just off Highway 2. You cross the railroad tracks to enter into Glacier Park and follow the signs to the Lake – a short ½ mile. There are also a couple of beaver ponds in this area, we followed a beaver trail right to its hut one day. This is a relatively flat area to snowshoe on. Fielding Cabin and Elk Mountain is another great snowshoe trail. Access to this trail is off Highway 2 just east of The Snowslip. You would drive in towards Glacier Park a little ways before you start your trek. After crossing the railroad tracks and enter into Glacier Park, it’s just a short distance to Fielding Cabin – a back country park ranger cabin – and from there, you can continue up the valley along the creek or head up Elk Mountain. A snowshoe trek along lower McDonald Creek is another great trail. This trail starts at the speed limit sign just north of the bridge over McDonald Creek on Camas Creek Rd. It’s a pretty level trail with very scenic views of the Creek, we encounter some beautiful Tundra swans on one of our treks. You can also snowshoe along McDonald Creek starting at the Quarter Circle Bridge. To access this trail, turn off the Going-To-The-Sun Road at the Glacier Institute sign, and follow it to the end where you’ll find a parking area. This trail along McDonald Creek is a little more challenging as it’s not maintained. Another great trail from the Quarter Circle Bridge area is to Apgar Lookout. To access this trail you’ll cross the bridge, snowshoe along the road to the sign for the Apgar Lookout trail. From there, you’ll start heading up the mountain with great views of West Glacier and surrounding areas as you traverse up the mountain. The views of Apgar and the Lake McDonald Valley from the top of Apgar Mountain is stupendous. It’s a pretty aggressive trail but well worth the effort. You can also snowshoe to the old fire lookout on the top of Triangle Mountain. To access this trail, you will turn off Highway 2 at Deerlick Creek, but remember, as with any trail to a fire lookout it is a pretty aggressive uphill trek. On the bright side, it’s downhill on the return trip. And since it was a lookout, the views from the top of the mountain are fabulous. 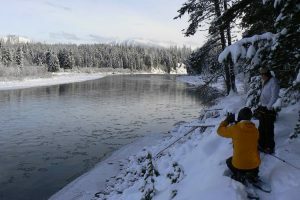 One of our favorite places to snowshoe is right from the Lodge, or from one of the Cabins, down to the North Fork of the Flathead River. You start it right outside your back door, down the ridge, across the ladder bridges, through the Wild and Scenic River Corridor to the River. You can go as far as you like either up or down the river. And you’ll have it all to yourself. The North Fork River earns it Wild and Scenic River designation and although I may be a little biased, I think it’s one of the most beautiful rivers in our area. On cross country skis trips, it’s reasonable to plan on traveling up to 12-15 miles in a day. On snowshoes, 5-6 miles a day is about the distance you’ll be able to travel. And if you’re looking for a great winter outdoor workout, snowshoeing will do that for you – especially if you’re breaking trail. Either one of these winter activities is a wonderful way to enjoy the quiet and serenity of Glacier National Park and the Flathead National Forest during the winter months.